To start, I think it’s fair to share some of the slightly less positive experiences we’ve had so you can consider the possibilities of what might happen. Some of the things we have experienced we’ve certainly never imagined happening. We booked a short three-hour activity that included drive time. Unbeknownst to us, we were absorbed into a longer tour that visited several of the places we had been at two days prior and it lasted over ten hours total. Because we were unprepared and did not want to repeat the same activities again, and did not want to pay the $200 cost of a cab back to the hotel, we were left to sit around for a few hours far from town where there were other things we could have done to pass the time. Needless to say, we were less than happy. We have had several instances of booking activities online through a third-party company, only to have that company not confirm our reservation with the actual tour providers. If these tour providers had not pulled some major strings upon our arrival, we would have missed out on our tours we were eagerly awaiting. We have been misinformed by tour company operators. We have missed sights and activities due to various closures because we did not look at the calendar and availability in advance. So, since we’ve had our fair share of experiences, here’s our Pros and Cons list of booking in advance vs. at your destination. Knowing specific requirements can make packing easier – for example needing to bring water shoes, pants, etc. While everyone wants to be guaranteed the opportunity to participate in top activities, get great concert seats, or being first in line to major attractions, we can’t recommend one method over another. If it’s something with limited seating or is likely to sell out, book it! Otherwise, the only thing we do recommend is doing your research in advance to get an idea of what is available and what things you would like to do. Also, be sure to check that things you want to do aren’t closed on certain days. Not every activity is offered every day. We also recommend if you do book with a third-party company, call the actual provider directly to confirm your reservation. As far as scheduling activities during your trip, we suggest doing things every other day to allow some freedom and flexibly in your itinerary. We also do not recommend booking things the day of your arrival, or even the day after, as we all know with traveling you do not always arrive at your destination on time. We have had good and bad experiences when we have booked in advance as well as when we have waited until we arrive. Regardless of when you choose to book, make sure to determine the things you want to do, the days it is available, and the price you are willing to pay to do it. If you like this post, please feel free to share it and please click the subscribe button to follow the rest of our adventures! Fantastic tips and great advice! We do a mixture of booking in advance and when we arrive and *touch wood* haven’t had any problems in advance, but then again, I read pages and pages of reviews on Trip Advisor before I book – a bit of overkill maybe? … possibly, but so far so good 🙂 (hope I haven’t jinxed myself now lol). Thanks for sharing! We usually read Trip Advisor for reviews and info too! I must say…Many (not all, but many) of our issues have been from various bookings with one major company…. 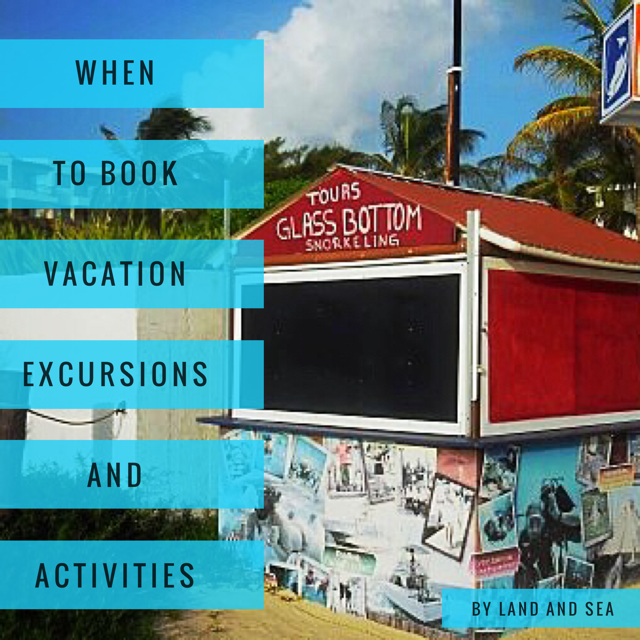 Great tips on pro’s and con’s of book vacations. Some activities I like to book ahead like my hotel but others I wait until I get there and see what’s available. Plus research ahead of time makes a differences. I agree not to book activities the day of your arrival and departure. Things don’t always go as planned. Love how you share your experiences and provided great tips! Thank you! We like to book when we arrive too, unless its something we thing we might miss out on otherwise. We try to have some things in mind we’d like to do at least though! One simply cannot miss out on seeing colorful parrots! Great tips Jen! We do a bit of both, I used to trip advisor trying to rate a certain tour, but have now started relying on travel blogs for advice. And definitely pays to check ahead on opening times, when we visited Beijing, the forbidden city was closed, which didn’t spoil our enjoyment, but I was more annoyed at myself for not checking the basics of opening times! We use Trip Advisor quite a bit, but I’ve found you miss out on things there. Blogs are the way to go for sure! We’ve missed things like the Underwater Sculpture Museum and buying the one brand of tequila we were after simply because we did not check the hours of operation. Boo! I usually wait to book activities unless I know it is very popular and might fill up. I like to get feel for what the locals like. I usually go off the beaten path so much that it is not much of an issue. I do research before I go but, even then I can change my plans. Thanks for the great tips! As you say this is a tough one and there’s never a right answer. I think if its really important to you and price isn’t a factor, booking in advance with a reputable provider is a great way to go. I have found that booking things in country, like day trips or 2 day trips in Vietnam for example, can be significantly cheaper than online by big tour companies. This is a very good list to consult when planning holidays. Yeah agreed, there is no real right or wrong answer as both methods have their pros and cons. I tend to do a bit of both. Sometimes its nice knowing that everything is taken care of before your arrive but other times I might feel more spontaneous and do as I feel each day. Excellent tips, thanks for sharing! I’ve also tried both ways and can’t quite make up my mind which one I prefer! In terms of ease, probably booking in advance, although the best trips I’ve been on have been spontaneously booked the day before!